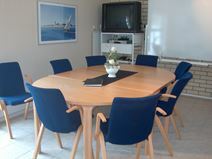 Office Space - Eidsvoll, . This high-quality, fully furnished Hobart office centre has a full selection of business support services and is ideally located. Rent inclusive of electricity, broadband and cleaning, so payments are simple and straight-forward. The site benefits from many amenities close by, such as restaurants, hotel, parks, etc. There is a museum just 5 minutes away by car, and the centre itself has parking facilities for your convenience.